Penny Ballem, MD, MSc, FRCPA is Clinical Professor of Medicine at the University of British Columbia Dr. Ballem has, over the last 30 years, been involved in the health sector as an academic, clinician and administrator. 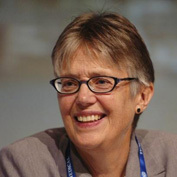 In 2009, she assumed the position of Vancouver City Manager. Following a successful career in haematology research, in 1995 Dr. Ballem founded and led the British Columbia Centre for Excellence in Women’s Health. In 2001, she was appointed Deputy Minister of Health of British Columbia and over the next five years served a total of eight ministers involved in the health portfolios. During her time as Deputy, she also served as co-chair of the Conference of Ffederal/Provincial and Territorial Deputy Ministers of Health. Since leaving government she continues to practice internal medicine at St. Paul’s Hospital, part of the University of British Columbia teaching network of hospitals, and works nationally and internationally as a consultant to governments and health sector organizations.